Things have been crazy. I have a big announcement out tomorrow and lots of fun things to post about. We’ve been busy going to DC and North Carolina, plus apple picking and meeting James van der Beek at Oktoberfest. Once I can find my SD card with the photos I can start sharing. 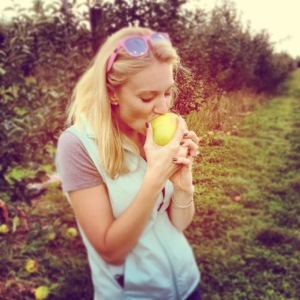 Like this Snow White moment I had tasting apples. This one was delicious. If only I had a photo of Daphne finding an abandoned baseball hat in the road and carrying it over a quarter of a mile on our walk this morning. She was determined to hang onto it, until she found a leaf. I have really loved writing a little bit and exploring what I want this blog to be. Being able to write anywhere (like in the parking lot at this moment) and learning that my posts don’t have to be long, just meaningful have been the two biggest lessons I’ve learned. So stay tuned for lots of excitement! This entry was posted in Life Etc. by Jen Nelson (jkhnelson.com). Bookmark the permalink.